Material: Made of high quality 304 stainless steel and aluminum alloy shell plating. Size: 3" Width x 10 5/8" Height. The chain length: 7 1/2". Please note that the Tillandsia Air Plant is not included. Whether you use this hanging air plant holder to display your airplants, charge your crystals, or simply hang empty, it is a great minimalist addition to any home. Fashion and popular, Finland traditional geometric ornaments, also, in Germanic, can be translate it into "Himmeli". This hanging air plant holder will perfect match with air plant, give you a sense of creativity. Simple and modern style, Let your life become elegant and comfortable. This hanging air plant holder can be used for planting your air plants, also can decorate your room, garden or your office. 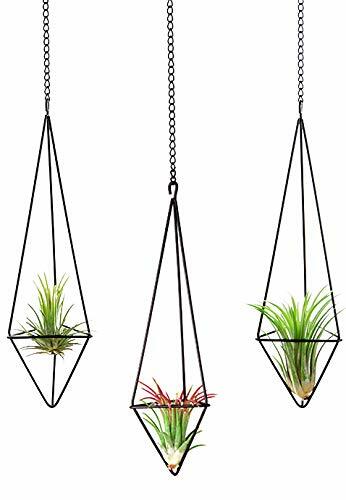 This hanging air plant holder looks gorgeous, perfect matches with air plant, would be a great addition to your room, gardens, patios and office. Material: Made of high quality 304 stainless steel and aluminum alloy shell plating. Durable and morden. Let your life become elegant and comfortable. Fashion and popular, Finland traditional geometric ornaments, also, in Germanic, can be translate it into "Himmeli". Strong and durable. Stereo sense is very perfect. The Himmeli with a chain, if you don't need, you can separate the chain. Give you a sense of creativity. Can be suspended from the ceiling to float in the breeze, or embraced as an air plant holder. Also can be nailed on the wall and put some air plants as a deco. Believe that it will bring you a different feeling. Size: 3" Width x 10 5/8" Height. The chain length: 7.1/2". Please note that the Tillandsia Air Plant and stick are not included. Mkono is a registered trademark and our product is professional manufacturing and sole selling.